Welcome to Intown Playgroup, a school for Toddlers and Parents and Caregivers. This is where children ages one through three learn and grow through play and discovery, and where families come together to learn about their children and early childhood education. 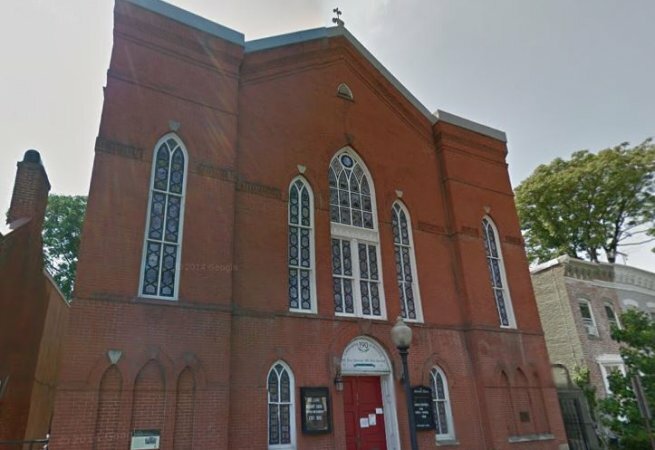 For over 40 years Intown Playgroup has been part of the Georgetown community in Washington, DC, gratefully housed in the historic Mount Zion Methodist Church. Our program introduces children to the bigger world of social experiences, nurturing them in the stage between playing at home and going off to school by themselves. Our full-time Director and her staff of two teachers believe in an emergent curriculum inspired by the Reggio Philosophy and other best practices in early childhood education. Classroom offerings are introduced and developed based on what we observe interests the children and what adults wish to highlight in order to extend a greater depth of learning. We are a parent cooperative, and parents are an essential part of our community. A parent or caregiver accompanies each child during the school day, playing and learning together. Parents also volunteer time to serve on the Board of Directors and participate in other special and social events. Intown Playgroup is a licensed, non-profit 501 (c)3 organization that is financially supported through tuition payments and run by the Board of Directors and staff. We enroll children who are one- and two-years old by September 1st of the year they enter our program. Children gather for the morning in the large open classroom, socializing with and learning from one another. At Intown Playgroup we recognize each child as a capable, unique and individual learner. We believe in a Reggio-inspired, emergent curriculum. Our philosophy is dynamic and recognizes the curiosities of the children supported by the teachers’ extensions enriching and deepening learning. At Intown we believe that children learn best through play and discovery. We view play as a vital experience through which children learn social, conceptual and creative skills, as well as increase their knowledge and understanding of the world around them. Play offers the opportunity for parents to engage authentically with their children. Parent participation is an essential part of our philosophy. At Intown we view parents as partners, collaborators, active participants, and advocates for children’s learning. We strive to work together and build strong relationships with parents and caregivers. Intown welcomes families Monday through Friday 9 AM – 12 PM throughout the school year, with the exception of major holidays, church activities, and extreme weather. Children and their caregivers are welcome to attend as often as they wish each week. Intown Playgroup does not discriminate on the basis of gender, race, color, national or ethnic origin or religion.